Sorry I Missed Your Party: USA #1!!! Have you ever heard about Americans who say they're Canadian when they travel abroad? They're probably accepting of fat chicks. contemplating "no stupid dudes" on the back of my jacket now. hahah i used to have a poster that said "no fat chicks in bikinis"
Make good money by just doing surveys and website evaluations. $4 for every website evaluation. I have to admit, I'd probably high five that dude. I am slightly ashamed that the word obscured by his hood appears to be "Philadelphia". I'm european and sorry to tell you we can spot the "fake Canadians" a mile away. 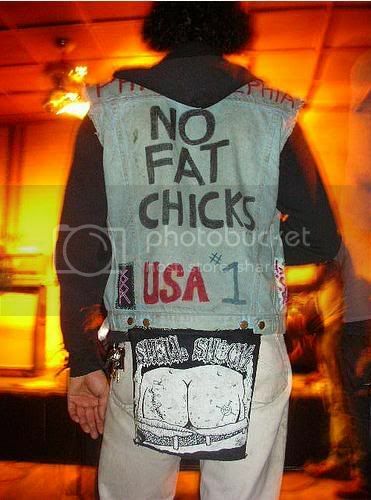 If you are able to wear a jacket that says "no fat chicks" & "USA #1" without feeling the lest bit concerned, best believe it stays with you where ever you go. My ex-husband used to laugh and say "no fat chicks" when I was overweight. I lost the weight, left him, and uh... I called him Baby Huey... Serves the idiot right.